Round Hill Cottage is approximately 750 square feet and offers high speed internet access, a well equipped kitchen area, living room area, cable TV, DVD player, walk-in closet, 3-piece bathroom, and two twin beds that can be converted into a king size bed. 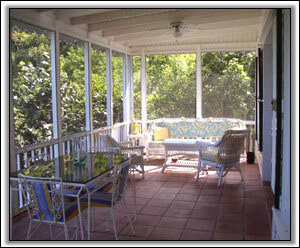 In addition to the inside living space, there is an outside living room and dining area in the large screened-in porch that overlooks the sea. 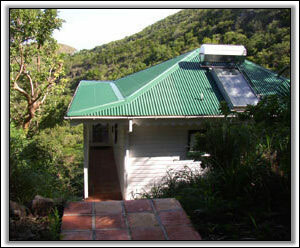 While staying at Round Hill Cottage, there may even be a few days where you will be able to watch the Ververt monkeys in the tress around the cottage from the screened-in porch as they travel their way down the hill! 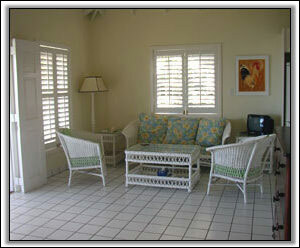 There are 5 beaches within a ½ mile radius of Round Hill Cottage. 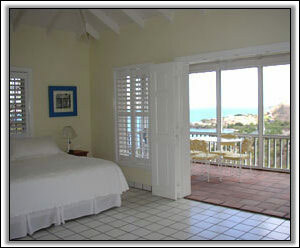 It is a 5-minute walk from the cottage to Oualie Beach where you will also find all the best water sports facilities on the island including windsurfing, scuba diving, sailing, and kayaking. Road and mountain bike rentals are also available at the beach. It's a 5-minute drive to the airport, 8 minutes to the Four Season's 18-hole golf course, and a 10-minute drive to town from the cottage. 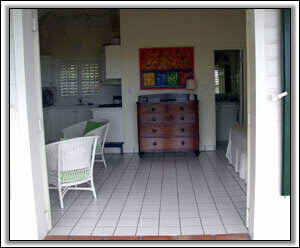 The cottage is within short walking distance of both Oualie Beach and Gallipot restaurants and close to a wide selection of restaurants in the area (including some of the finest restaurants on the island). The selection ranges from quick breakfast spots at Wendy’s Deli or Oualie Beach, casual dining at Sunshine’s Beach Bar and Restaurant, Mount Nevis Pizza Beach, Oualie Beach, Chevy’s on the beach, Shirley’s Place or Gallipot restaurants, International and Caribbean cuisine at Banana's Restaurant, Mango’s Restaurant, or Mount Nevis hotels, and more formal dining that can be enjoyed at the Four Season's Hotel, Nisbet Plantation, and Coconut Grove Restaurant - all located just minutes away by car. 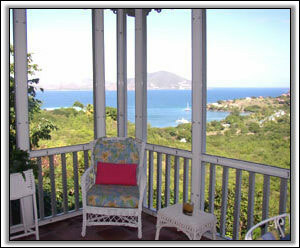 If you are looking for a little piece of paradise and enjoying some spectacular views, relaxing at the beach, hiking a mountain, or exploring the many ruins on the island, Round Hill Cottage on Nevis may be the place for you!